It is shown that real-time 2D solid-state NMR can be used to obtain kinetic and structural information about the process of protein aggregation. In addition to the incorporation of kinetic information involving intermediate states, this approach can offer atom-specific resolution for all detectable species. The analysis was carried out using experimental data obtained during aggregation of the 10.4 kDa Crh protein, which has been shown to involve a partially unfolded intermediate state prior to aggregation. Based on a single real-time 2D 13C–13C transition spectrum, kinetic information about the refolding and aggregation step could be extracted. In addition, structural rearrangements associated with refolding are estimated and several different aggregation scenarios were compared to the experimental data. Protein aggregation has become recognized as an important aspect of the protein folding landscape. This process not only interferes with protein expression and recovery assays used in biotechnology, but also impacts the every day live of cells and organisms and is associated with a variety of human diseases (Dobson 2003; Wetzel 2006). Methods to characterize aggregation kinetics comprise predominantly biochemical and biophysical approaches such as gel filtration, sedimentation assays, binding of fluorescent markers, AFM imaging, dynamic light scattering or circular dichroism that report on the oligomerisation state or the overall secondary structure content of the protein (Hurshman et al. 2004; Wetzel 2006). Real-time solution-state NMR has shown to be useful to follow protein and RNA folding at the level of individual residues (Balbach et al. 1996; Van Nuland et al. 1998; Zeeb and Balbach 2004; Corazza et al. 2010; Lee et al. 2010). In principle, solid-state NMR (ssNMR) offers a complementary spectroscopic means to probe structural and kinetic aspects of protein folding and aggregation, especially as molecular aggregates increase in size. Indeed, ssNMR, has made great progress to structurally study trapped intermediate states of Amyloid (Chimon et al. 2007; Ahmed et al. 2010) and globular (Hu and Tycko 2010) proteins or to examine the effect of protein mutations known to interfere with protein aggregation (Heise et al. 2008; Karpinar et al. 2009; Kim et al. 2009). In principle, kinetic information becomes accessible by repeating ssNMR on cryotrapped intermediates at different time points or by recording NMR data directly during refolding. Indeed, time-resolved 1D ssNMR has been used to detect signal intensity buildup or decay during protein aggregation (Kamihira et al. 2000) and ATP hydrolysis of an ABC transporter (Hellmich et al. 2008) or by combining ssNMR pulse schemes with diffusion measurements using PFGs (Ader et al. 2010). Due to limited spectral resolution 1D ssNMR has to be combined with specific labeling techniques to offer site-specific resolution in proteins. Earlier, we have shown (Etzkorn et al. 2007) that for the Crh protein from B. subtilis, molecular aggregation triggered by a small temperature jump can be followed by two-dimensional ssNMR. Starting from a kinetically destabilized protein precipitate, protein aggregation led to significant increase in β-sheet content, whereas smaller α-helical fragments were retained in the aggregated state. Using Crh as an example, we here demonstrate that 2D ssNMR data sets recording these structural rearrangements in real time offer structural and, in particular, kinetic information about the process of protein aggregation. In general our analysis can offer atom-specific resolution for large segments of the protein and can simultaneously detect and kinetically describe a range of possible intermediate states during protein aggregation under conditions where molecular size or density prohibit the application of other biophysical methods. While the scaling factors a n account for variations in signal intensity among the different states n, the parameters λn are determined by the transverse spin relaxation rates. The kinetic profile P n (k j , t) reports on the population of state n characterized by resonance frequency ω n at a given time and depends on one or several rate constants k j describing the transition. Note that (2) already includes the FT in the direct dimension (t 2) leading to the Lorentzian functions L n (ω 2,n ) for the states n. An exponential decay of state A during the evolution period in the indirect dimension is mathematically equivalent to an increased line-width for state A, whereas an exponential increase in the population leads to a base-line distortion and the occurrence of negative ‘shoulders’ of the corresponding peaks. These characteristic features are typically found experimentally in real-time NMR during protein folding in solution (Balbach et al. 1996). For analysis relevant 1D extracts of real-time 2D spectra are usually fitted to theoretically simulated peak shapes (Balbach et al. 1996; Helgstrand et al. 2000) or a direct analytical solution (Balbach et al. 1999; Zeeb and Balbach 2004). Due to increased spectral overlap in ssNMR, we used (2) to develop a Mathematica (Wolfram scientific) script to calculate the difference of a full theoretical 2D cross peak pattern and the experimental data. Different transition scenarios were examined by varying the mathematical description of the kinetic profile. Amplitude factors a n were set to one, implying the same transfer efficiency for all states. Free theoretical parameters such as λ (1;2),n and ω (1;2),n were chosen according to the line width and position of the peak maxima in the experimental spectrum. Mathematica (Wolfram scientific) version 6.0.1 was used to fit the experimental data to simulated peak patterns by numerically integrating (FT) S(t 1, ω 2) (2) for the population profiles considered. ‘SymbolicProcessing’ was switched off to speed up the integration process. The experimental spectrum was processed using exponential line broadening of 50 Hz. The underlying window function was also implemented in the simulations before FT in the indirect dimension. The effect in the direct dimension was neglected. Resonance frequencies of the occurring states were taken from corresponding cross signals in the experimental spectrum. The line width was measured using the Thr Cβ–Cγ2 cross peaks, which in the real-time 13C–13C 2D spin diffusion spectrum are not symmetric to the Thr Cγ2–Cβ peaks. Here the line width in the direct dimension is resolved and should be largely unaffected by the transition. The line width was comparable for all states, hence justifying in part the assumption a n = 1 for all n.
Experimental data were taken from Etzkorn et al. (2007). Signal intensity in the simulated spectra was read out at the corresponding data points obtained by processing the whole experimental spectrum with 512 points in ω 1 and 2,048 in ω 2. The spectral extract of the Thr Cγ2–Cβ (Cβ–Cγ2) cross section consists of 31 × 21 (21 × 31) values which were treated individually. Free parameters of the kinetic profile were varied in nested loops. To evaluate the subset of the torsion angle space that is in agreement with the experimentally observed Thr Cβ shift we generated a set of heptapeptides (AATAA) by varying the Thr ψ and ϕ torsion angle in steps of 10°. ShiftX (Neal et al. 2003) was used to predict the expected chemical shift for each peptide. Chemical shift intervals [68.4, 70 ppm], [69.7, 70.8 ppm] and [70.4, 72.5 ppm] were chosen to select a match for the states A, B and C, respectively. As described in Etzkorn et al. (2007), protein aggregation of the Crh protein induced by a modest temperature increase could be detected in real time during a 2D (13C, 13C) ssNMR experiment. The transition can be readily followed using cross-signal intensities in the Thr Cγ2–Cβ region. As visible in Fig. 1 the transition spectrum reveals resolved peaks for the initial state A (natively folded), an intermediate state B (partially unfolded) and a final state C (aggregated). Hence, application of (2) involves summation over three states (n = A, B, C). As shown before (Havlin and Tycko 2005; Heise et al. 2005) cross peak positions and line width offer a spectroscopic means to estimate the changes in backbone structure resulting from protein refolding. In the case of the Thr Cγ2–Cβ region, a torsion angle analysis for the involved states is presented in Fig. 2. In Fig. 2a, a subset of torsion angles which agree, according to shiftX (Neal et al. 2003), with the measured Thr Cβ peak position is shown. Note that dihedral angles predicted for the A-state (blue circles) agree well with values predicted from the X-ray structure for involved Threonines (black crosses, see also Etzkorn et al. 2004). An additional refinement of torsion angle space sampled during refolding can be obtained by taking into account allowed regions of the Ramachandran plot (Fig. 2b) and by considering only lowest energies assuming an amino-acid specific torsion angle potential as given in Kuszewski and Clore (2000) (Fig. 2c). Especially for the latter case, we find that the observed changes in the 2D ssNMR spectra can be explained by rather small changes in (Phi, Psi) space, at least in the case of Thr resonances. The global minimum in Fig. 3a is given for the effective rate constants k 1 = 1.36 × 10−4 s−1 and k 2 = 0.58 × 10−4 s−1. Since the best fit (Fig. 3g) still shows some considerable differences to the experimental data, calculation of the error margin is not attempted here. However, the transition predominantly interferes with the acquisition of the indirect dimension rendering the (13C, 13C) spectrum asymmetric and cross peaks on different sides of the diagonal offer an independent set of information. Figure 3b shows the difference plot for the Thr Cβ–Cγ2 cross correlations. The minimum is found for k 1 = 0.77 × 10−4 s−1 and k 2 = 0.52 × 10−4 s−1. Combination of data from both sides of the diagonal leads to the difference plot shown in Fig. 3c. The respective population profiles according to the best fit rate constants allow for an estimation of the accuracy of the method. The rate constants obtained from Fig. 3c are k 1 = 0.91 × 10−4 s−1 and k 2 = 0.65 × 10−4 s−1. Notably, the comparison of the theoretical spectra to the experimental ones (Fig. 3g, h) shows that characteristic features such as line broadening for the initial as well as baseline distortions for the final state are significantly less reproduced by the experimental data than expected for the considered single exponential transition. Figure 4 summarizes the results obtained with this model. The three-dimensional contour maps shown in Fig. 4a–c, visualize areas which are within 5% (red), 10% (pale yellow) and 15% (white) deviation from the minimum difference between experimental and simulated cross section of Thr Cγ2–Cβ (a), Thr Cβ–Cγ2 (b) and both (c). The resulting population profile of the minimum is shown in Fig. 4d–f, respectively. Figure 4g, h compare the best fit (according to c and f) to the experimental data. Notably, a comparison to the best fit according to a single exponential three-state transition (Fig. 3a, b, lower part), reveals that the assumption of a nucleation step here did not improve the fitting. Indeed the line broadening of the initial state is predominantly related to the unfolding mechanism and, as evident from Fig. 4g, h, not reproduced even by the best fit of the profiles represented by (6a–6c). Equations 7a–7c contain four free parameters. The results of fitting this model to the experimental spectrum as a series of 3D contour maps depending on the parameter b are shown in Fig. 5. Each 3D plot depends on the same three parameters as described in Fig. 4. Although the high number of free parameters impedes an accurate determination of the rate constants, it is clearly evident that the simulated cross correlation approaches the experimental data for b < 1. Plotting the minimal difference to the experimental data as a function of b (Fig. 5b) reveals that the global minimum is found for b = 0.1. However, also values up to b = 0.4 may reproduce the experimental spectrum within an error of 5%. Figure 5c–e shows the population profile as well as the resulting peak pattern of the best fit (b = 0.1; k 1 = 2.03 × 10−4 s−1; k a1 = 0.78 × 10−4 s−1; k a2 = 0.81 × 10−5 s−1). Indeed the stretched exponential unfolding scenario could explain the missing line broadening in the experimental data of state A. Notably, a completely heterogeneous aggregation scenario also involving a stretched exponential aggregation step as suggested for transthyretin aggregation (Hurshman et al. 2004) could also explain the data (see supporting figure SI 1). However, experimental data analyzed here exclusively report on the population profile. Additional studies on the effect of concentration of native Crh and of seeding with preaggregated Crh may help to discriminate between stretched exponential aggregation, i.e. heterogeneous growth of aggregates with the monomer as the critical nucleus size, and the F–W model, i.e. continuous nucleation followed by an autocatalytic surface growth (Ferrone 1999; Hurshman et al. 2004). Several methods exist that allow studying protein aggregation kinetics. Most of these techniques rely on the detection of global factors or indirect mechanisms (e.g. the β-strand content in Thioflavin T binding or CD spectroscopy) and may lack the formation and kinetic properties of intermediate species. Here we have shown that ssNMR can contribute to the kinetic and structural analysis of insoluble protein conformations, in particular of those including intermediate folding states which might be an important target to interfere with the aggregation process (Cohen and Kelly 2003). While intermediate states might be rapidly frozen for a more detailed structural study (Chimon et al. 2007; Ahmed et al. 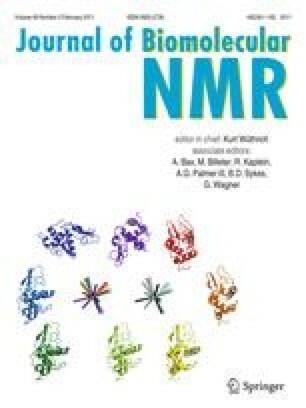 2010; Hu and Tycko 2010), real-time ssNMR offers unique possibilities to characterize aggregation kinetics. The range of observable states can be modified by a combination of different sets of polarization transfer mechanisms (e.g. based on dipolar or scalar couplings) (Andronesi et al. 2005) or by simply recording ssNMR spectra after direct excitation (Kamihira et al. 2000). Our analysis was solely based on ssNMR cross-signal intensities from a single kinetic transition to investigate the potential of the method. Changes in backbone conformation were estimated from an analysis of conformation-dependent chemical shifts. Rate constants could be extracted using a single exponential three-state transition as well as a conventional aggregation mechanism. No significant difference between the two approaches could be detected, suggesting that the formation of a nucleus is not a significant step in the aggregation of Crh protein precipitates. Remaining differences to the experimental data additionally suggest that a single exponential transition for the initial unfolding step does not suffice to properly describe the time course of the folding process. Instead, a stretched exponential function, as found in downhill folding (Sabelko et al. 1999; Nakamura et al. 2004), significantly improves the agreement between experimental and theoretical data. The stretched exponential decay would be consistent with a heterogeneous unfolding step involving one or several fast as well as slow decaying components. While limitations regarding sensitivity and resolution do not allow for a more detailed analysis of the aggregation mechanism from ssNMR at this stage, ssNMR studies using selectively labeled protein variants and the combination with other biophysical methods will provide additional opportunities to refine kinetic and structural profiles. Such studies may not only be relevant in the context of molecular aggregation but their application may also facilitate an atomic description of inter-molecular interactions in the context of molecular gel formation (Ader et al. 2010) or protein insertion into membranes. This work was funded by NWO (Grant number 700.26.121), the CNRS (PICS no. 2424), the French research ministry (ACI Biol. Cell. Mol. Et Struct. 2003; ANR JCJC 2005; ANR-PCV08_321323), and the Max Planck Gesellschaft.